PTA General Member Meeting: all meetings are held on the second floor, in Room #237. Please see our new site for all details. Please copy & paste above link into your address bar. 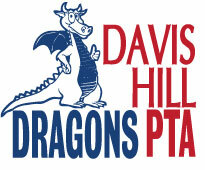 What does the Davis Hill PTA do, exactly? Community Events sponsored by the PTA include: Our Annual Dragon Dash 5K, Fall Festival, Holiday Fair, Family Fun Nights, Arts & Sciences Night, Teacher Appreciation luncheons, and more! Student Fun like The School Store, Spirit Wear Sales(adding some exciting new items), Food Pantry donation collections. Our PTA provides Enrichment programs for each of our grade levels. Examples of Enrichment programs have included: Birds of Prey, “Physical Changes of Matter” and “Rocks & Minerals” by The Discovery Museum, The ZooMobile, ImprovBoston, and many more! Our PTA supports our teachers and staff with classroom equipment where requested. We support the Wachusett Food Pantry by taking food donations on the first Wednesday of every month, September – June. In fact, our school is the biggest single donor to the pantry, after their main fundraiser The Holden Road Race. We collect non-perishable, non-expired food items of any kind but for fun, we have a “Theme” each month with a corresponding fun theme for the kids that participate. It is an excellent opportunity for our students to contribute to our greater community and have fun at the same time! If you are available on Wednesday mornings, please consider helping collect & transport the food from Davis Hill to the pantry’s West Boylston location! Please see the Food Pantry page linked on the left for more details about dates and themes. See Box Tops For Education’s latest contest to easily win up to 5,000 free boxtops for our school here! Simply have your child bring clipped Box Tops for Education Labels to the school. Volunteers will submit the counted labels to General Mills, who in turn give us ten cents for each Box Top! This may seem insignificant, but with all of us working together it adds up quickly. For every submission of 25 box tops (in zip-lock bags or on the downloaded sheets), your child will be entered to win a Raffle drawing that is held on the last Friday of every month and announced during morning school announcements! For more information about Box Tops for Education and eligible products, please see their website. Or you can do your online shopping through their website and our PTA gets a donation every time! **Note use Amazon Smile and select the Davis Hill PTA as your charity when you shop at amazon, to support these and other great events!